The most important concept at GreenGro is the idea of a living soil. Just as the ocean is full of life, soil is also teaming with a vast array of organisms that endure and rely on a symbiotic relationship. GreenGro's products all contain these beneficial microorganisms that will help your soil flourish, and promoting a living soil system for plants to thrive in. GreenGro, LLC aspires to be the leading biological soil amendment company in the United States. We want to raise awareness for green, sustainable farming practices and contribute to charities that promote sustainable practices. Our Flower Finisher is intended for use in the final stage of Bloom. Building upon our Nature's Pride base bloom, Flower Finisher is formulated for the unique needs of a plant during the final 4 weeks of flower development. 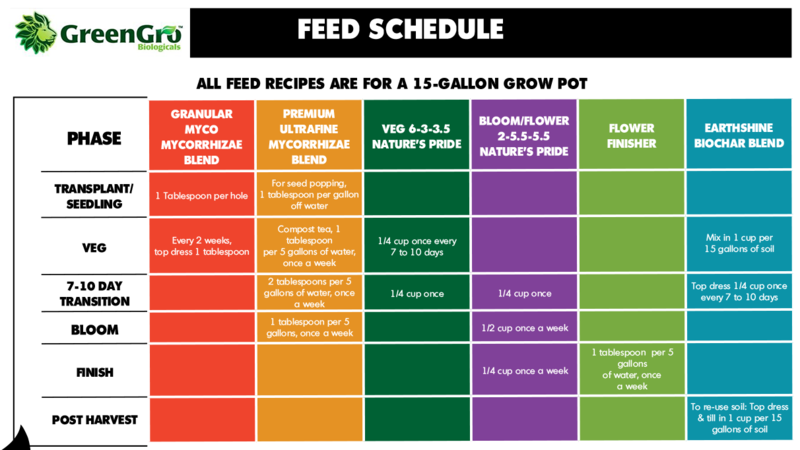 See the Feed Schedule here.